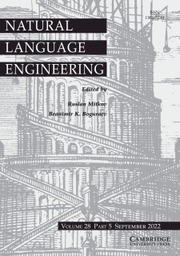 Natural Language Engineering meets the needs of professionals and researchers working in all areas of automatic language processing, whether from the perspective of theoretical or corpus linguistics, translation, lexicography, computer science or engineering. Its aim is to bridge the gap between traditional computational linguistics research and the implementation of practical applications with potential real-world use. As well as publishing original research articles on a broad range of topics - from text analysis, machine translation, information retrieval, speech processing and generation to integrated systems and multi-modal interfaces - it also publishes special issues on specific natural language processing methods, tasks or applications. The journal welcomes survey papers describing the state of the art on a specific topic. Natural Language Engineering also publishes the popular Industry Watch and Emerging Trends columns as well as book reviews.